Knot Hard to Do! 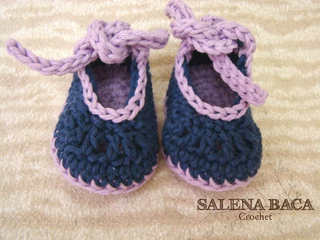 Baby Booties - Complete with 13 color photos to help you successfully complete every row of this pattern - Enjoy! Yarn: Weight 4 (Medium weight) yarn. 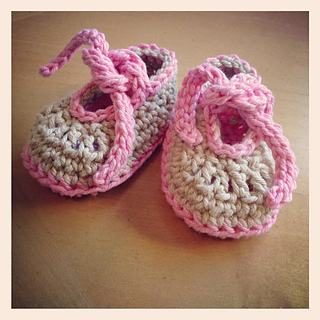 Example pictured using Martha Stewart Cotton Hemp Yarn. Size Chart For the best possible fit, please assure you follow the size of your subject. This chart is approximated, and actual subjects do vary. This is an original Salena Baca pattern: Owner / Designer of Baca Creations. My copyright prohibits redistribution of this design in any form: trade, free or for sale. finished products may be sold, but please provide me with credit for the design when you sell online, and a link back to this design would be much appreciated! Pattern Note: This pattern begins at the sole of the shoe and continues in rounds upward. You must repeat each pattern two times to make 1 pair of booties.